This 4x4 Jeep Wrangler is a superior off-road machine with only 76,533 miles. X trim. California owned with only one previous owner. Excellent maintenance history with zero accidents or damages according to Carfax! Powered by a 3.8L, V6 engine with a Manual 6-speed transmission. Although the Wrangler was bred for off-road use, it is surprisingly fun to drive around the city. Its steering is light and the ride is comfortable. Original Deep Water Blue pearl coat with black soft top, padded roll bar, privacy glass and running boards. The top goes down, the doors come off and the ground clearance is 10.2 inches. The interior has medium-to-dark gray leather upholstery and is of the rough-and-tumble variety, designed to get dirty and then be easily cleaned. Great quality Jeep floor mats. Simple and easy-to-use controls. Owners manuals included. Premium Kenwood CD stereo system with Aux port, USB port and Infinity surround sound. All Wranglers feature dual airbags, antilock brakes, stability control with a rollover sensor and hill start assist. In government crash testing, the 2009 Jeep Wrangler earned a perfect five stars. 16' Premium Jeep steel wheels wrapped in Great Quality Goodyear Wrangler ST tires. Full size spare included. 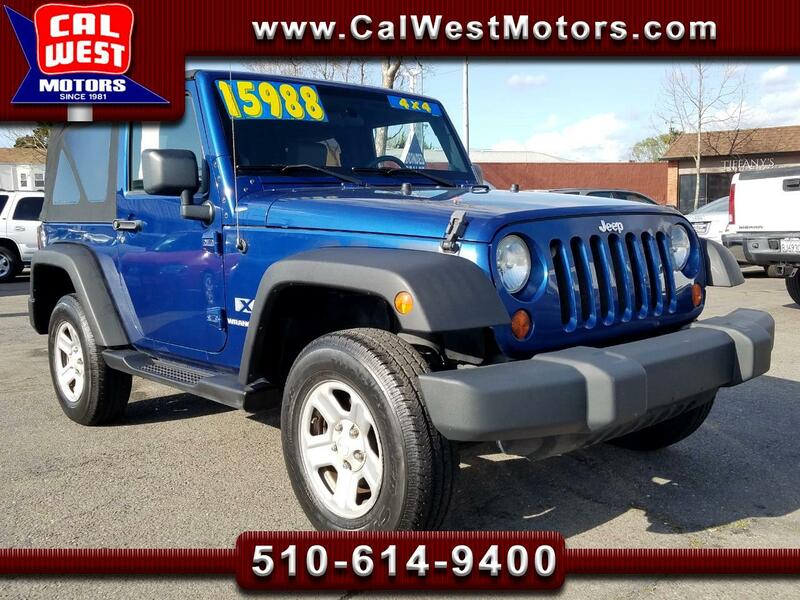 With this Wrangler's Off-Road Capability, Strong Engine and Transmission and Great Condition makes for Excellent Value under $15,000!